Have you ever read a book without words? Some people may find this difficult as it opens up many possibilities, different interpretations and imagination. But it is something we need to introduce ourselves and our children to – as just because the words are not on the page does not mean they are not there. I have always loved books without words as you can decide what happens on each page and look more closely at the illustrations which can tell us so much more. 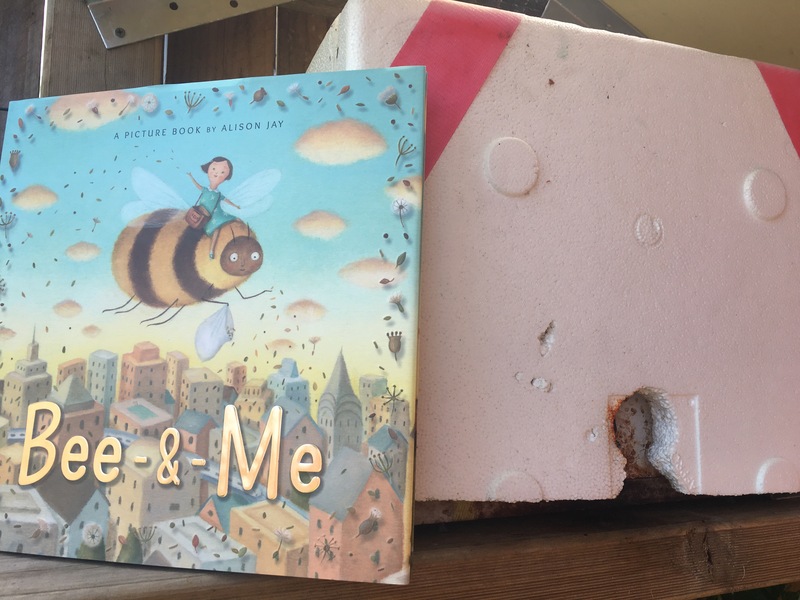 Bee and Me by Alison Jay is set in a bustling city of cars, trucks, people, shops and high rise buildings but no flowers. A little girl is frightened by a bee who lands on her windowsill but luckily rather than swat it with the fly swatter she looks after the exhausted insect and sends it on it’s way. The bee returns in need of more care and the two form a beautiful friendship. The double page of play between the girl and the bee is wonderful to sit and stare at with your child. Talk about what they are doing together and the emotions they are feeling as they spend wonderful moments together. The bee soon realises that although he has the girl – he longs for flowers. So together they embark on a magical journey to find flowers, seeds and more green to the dull city. 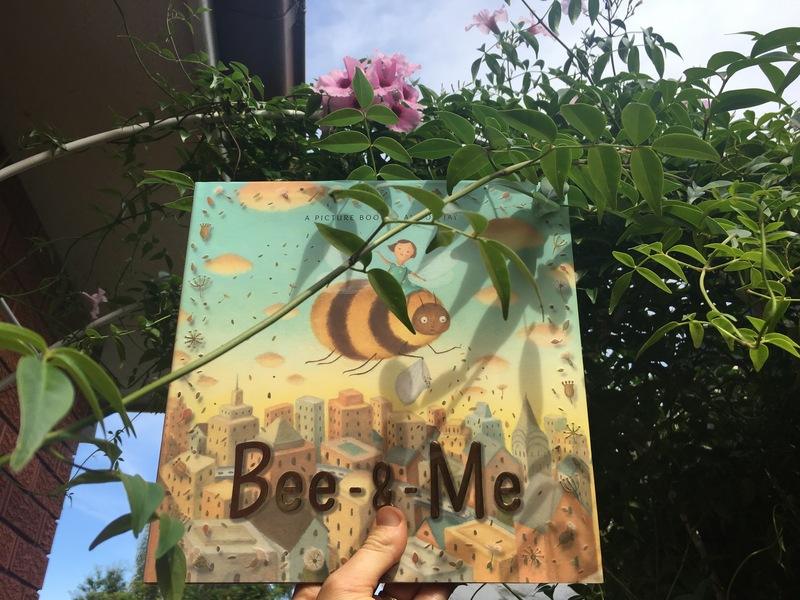 Bee and Me warmed my heart – the friendship between the two is infectious and the message about the importance of bees is also taught – which is vital as so many cities are lacking bees, butterflies and other beneficial insects due to lack of flowers, plants and green! So what can you do at home or at school with this book? Have a look around your home and see what would entice any type of insect to your area? all insects are beneficial and attracting them to something they can live off or eat is important. It’s better they live off the plants than things in your house! Alison Jay has left a parting note at the back of her book about the beneficial flowers you can plant in your garden. Herbs are an easy plant to start with as they can be grown in small planter boxes on windowsills – give rosemary, thyme or mint a go. 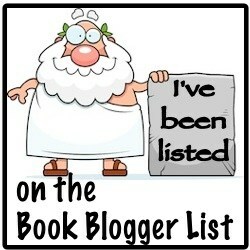 See my older posts about bees and link in some of those ideas to this book. 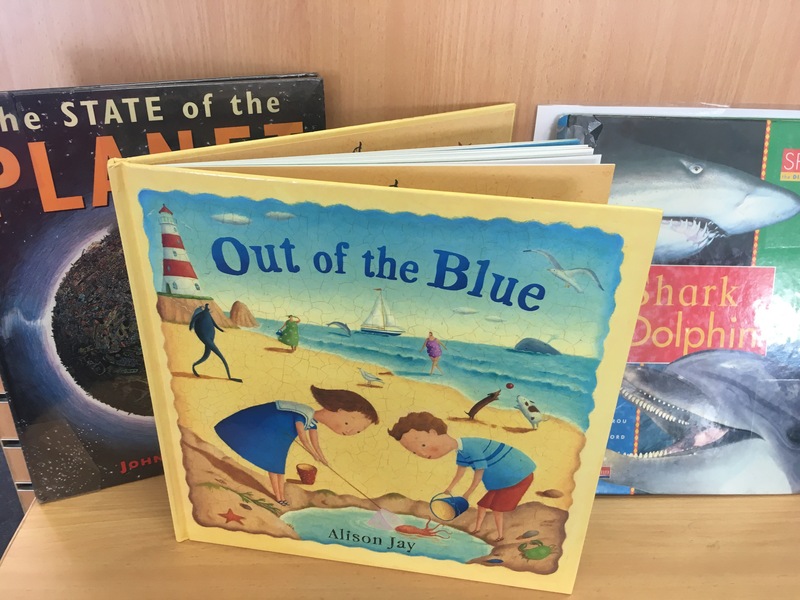 Visual Literacy – Books without pictures open a myriad of possibilities. One activity to try is to tell the story from the bee’s perspective and then the girls. Compare the two stories – compare the emotions, the goals and the thoughts of the two characters. Find some more books that have bees in them – you’ll bee surprised! Do these stories all have a similar message to tell? Compare scientific literature to children books that are on the topic of bees. Why do we need both types of literature out there to understand the need for bees in our world? Create your own bee themed picture book based on some scientific literature. Create your own story about your adventure with a bee. Which flowers would you like to visit? Divide a page into four sections and draw a series of pictures that show what you would like to do with a bee to make sure there are enough flowers, fruits and vegetables in the world. How is honey used in our lives apart from to eat? Investigate the different properties of honey and how it is used in a myriad of products! Where are bees located? What type of environment do they need to thrive? Create a honey bee and a stingless bee map of Australia. Why are honey bee hives made out of hexagonal shapes? Why do stingless bee hives spiral shaped? Investigate the different shapes of bee hives across the globe and why they are this shape. Could they be another shape? Investigate if there is a better way to keep honey in a hive. Spark by Adam Wallace is a captivating tale of a spark building into a consuming fire. It has been brilliantly illustrated by Andrew Plant, making the reader feel that they are moving with the fire on it’s destructive journey. The wind was meant to be my friend but it just laughed and dragged me on. As I read through the story I felt a relationship grow between myself and the spark – I wanted to follow it and find out what it became and where it went . As it built up into a raging fire, it expresses how it feels and how things around it feel – giving life to everything it touches. The story moves at a fast pace, leaving the reader burnt out and deflated towards the end but with one last page there is hope – and the knowledge that fire can bring about new life. So how does this link to sustainability and the environment? Do we need bushfires? forest fires? any type of fire in a natural landscape? Investigate which types of plants and animals rely on fire for their life cycle. Investigate bushfires of the last 5 years in one particular area. How have they been started? What have they destroyed? Has the land regenerated? How much of the air pollution in the world is caused by burning trees? Investigate slash and burn methods in some developing countries – how does this effect the soil quality? air quality and livelihood of the people? All life forms, including human life, are connected through ecosystems on which they depend for their wellbeing and survival. World views that recognise the dependence of living things on healthy ecosystems, and value diversity and social justice, are essential for achieving sustainability. Personification – explore the use of personification throughout this story. ( Just a few to start you – tickled trees, wind whispered, chased animals, skipping and sprinting together, breathing in the bush, hauled through the undergrowth, thrown high, fear surged ). How does personification change the feelings you have towards bush fires? Choose something that is in the Australian bush and personify it! Allow children to investigate different trees or flowers , animals or insects. Point of View – Could this story be written from the wind’s point of view? Why does writing it from the fire’s point of view change how we feel towards a bush fire? The end page – How does this change how you feel towards the story? How would you feel without it? Create your own story where the view of the story is changed on the last page. Thinking – How did the Spark begin? Use knowledge from the story to work this out and create a earlier chapter to the story. How would a spark start in 2016? 1916? 1616? 20000BC? 50000BC? Visual literacy – why are some pages without words – how do these set the mood? How has the style of the illustrations affected the mood of the story? Which page do you like the best – how does it make you feel? Australian has a lot of bushfires, mostly throughout summer. What is a bushfire? Do other countries have bush fires? Do we need bushfires? Investigate the history of bushfires throughout white history but also if the Indigenous people used fire to help the land. Who helps out in bushfires? Investigate the rural fire service, fire fighters and volunteers in Australia who help out when it comes to bush fires. The influence of the environment on the human characteristics of a place (ACHGK028)The impact of bushfires or floods on environments and communities, and how people can respond (ACHGK030).